The Doctor (Peter Capaldi) is dangling from the roof in front of a child named Grant’s window. Grant loves comic books and with his mom’s permission (probably thinking her son is imagining he’s seeing Santa), lets The Doctor into his room. They soon make it back to the roof where the Doctor explains to Grant that he has built a machine to reverse paradoxes. All this time Grant is coughing and the Doctor hands him a glass of water and asks him to hold a gem stone. The powerful gem is one of only four in existence. What is magnificent about the gem is that it grants your wishes and unfortunately for The Doctor, Grant swallows it thinking it was medicine for his cough. Since Grant is a lover of comic books his wish is to be a super hero – and that is what he becomes. 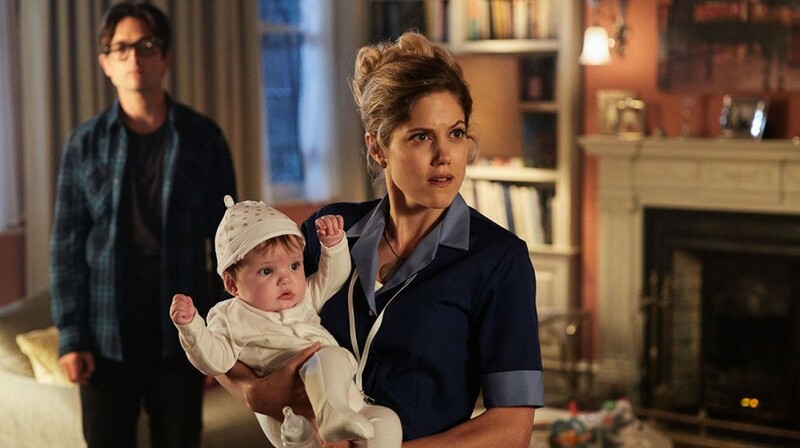 Present day sees The Doctor and Nardole (Matt Lucas) investigating the company Harmony Shoals and they are not the only one, as investigative reporter, Lucy Fletcher (Charity Wakefield), is there also. What they discover is that an alien race of sentient brains is looking to invade Earth by being placed in a human body – most importantly world leaders bodies. The three snoops are soon discovered by Dr. Sims (Aleksandar Jovanovic), who is very willing to shoot them so they do not expose his plans when suddenly there is a knock on the window. This shouldn’t be possible because they are on the 100th floor but to their amazement there is a man is a superhero costume that breaks the window and saves them. The Doctor realizes that this is the child Grant (Justin Chatwin) all grown up and they are now in the middle of an alien invasion which The Doctor must somehow stop. It’s been a year since we have had a brand new episode of Doctor Who, a whole year since “The Husbands of River Song” graced our screen. Needless to say there has been some excitement stirring in the Doctor Who fandom and I was one of those anxious to see it. But after seeing the trailer I was more than a tad hesitant over “The Return of Doctor Mysterio”, as my first impression was that it didn’t look good at all; in fact, this looks bad. After watching it on Christmas Day I felt a little bit better about it as it didn’t turn out as bad as I had feared it would be. Now I’m not saying this is the greatest Christmas Special of all time, nor am I saying it is the worst. In fact for the most part it was pretty entertaining but it didn’t really grab me. There were parts of it that I liked and those outnumbered the parts I did not, so on a whole, I did enjoy it. The problem is that there have been better Christmas Specials and this one will sit in the middle of the pack. I felt that the story was pretty weak and the ending wasn’t all that clever. In fact the worst part of “The Return of Doctor Mysterio” was the story. It did not have a Doctor Who feel to it all that much as it felt more like a romance story. Not that that is a bad thing, except it just took away from what Doctor Who should be. I wasn’t that thrilled with the solution to the problem of the alien invasion but with the whole superhero theme going on it did work for this story. I did like that for the most part it was an homage to superhero movies and in particular Superman. I liked that there were some nods to the Christopher Reeve Superman movie from 1978. In fact it had that feel to it from that movie to the interview and flying Lucy home right down to the romance part of it. That was pretty cool and I’m sure a few of the older fans will pick up on that. Plus there were a lot of superhero Easter Eggs in this story from Spider–Man to vintage comics which I thought was pretty neat. Also how many noticed the movie that was playing was The Mind of Evil which is a nod to the Jon Pertwee era? It looks like the aliens Harmony Shoal will be making another appearance in the future as it appears Dr. Sim escaped at the end. This is the second appearance of the aliens from Harmony Shoal following their appearance in last year’s Christmas Special. It appears writer Steven Moffat wants to create one more reoccurring monster before he leaves the series as head writer and showrunner, and hopefully he makes them a lot more menacing the next time we see them. In all, they are not that bad of a baddie except they stick out like a sore thumb with that big scar on their face. 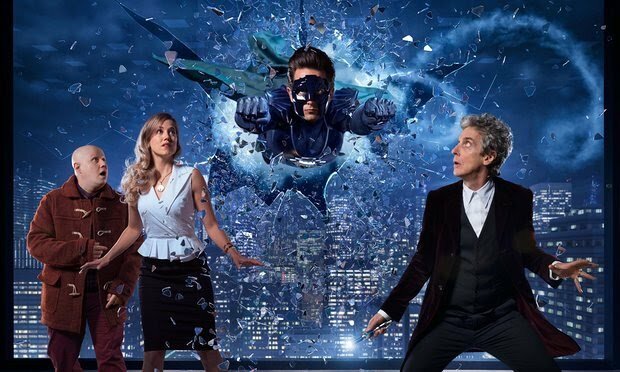 While “The Return of Doctor Mysterio” wasn’t a great Doctor Who Christmas Special it was entertaining, and if you love superhero movies and comic books you’ll really enjoy it. But it wasn’t the worst thing they have ever done on Doctor Who even though the jury is still out on Matt Lucas’ s character Nardole but I’m sure we’ll get to see more of him in Series 10. “The Return of Doctor Mysterio” didn’t get me all jazzed up for it, I did find it enjoyable for the most part and made me looking forward to more Peter Capaldi in Series 10.